This post would probably make a better Thursday post so for this week I’ll swap them about and give you a writing update then. I just felt the need to write about this straight away! Today I read one of those articles that makes me think about the nature of writing. It was an interview with Rachel Cusk, whose writing notoriety comes of a very personal telling of the story of her divorce. There were three specific points that struck me: that the line between fact and fiction is a murky one; that writers should not accept not being liked; that life as a writer is lonely and unsettled. Obviously the third is a personal experience and not one all writers would subscribe to, but the idea of planning for a couple of years then going into isolation to write for a month does have its attractions 🙂 I think my biggest writing failure is lack of planning, so if I were to learn anything from Cusk it would be to do more of this, and the reality of my experience is that when I don’t plan sufficiently, I have a great start to a story but fizzle out in the middle. However, for me as an individual, cutting myself off and being distant rather than friendly seems unnatural – I am definitely a people person! So maybe the take-away is to accept that time alone is beneficial and learn to build it in as long as it suits me. The second is as much about having a thick skin as anything else but is also about how much of a shared experience it is reasonable to use in your work without the agreement of the other parties. It’s tied closely into the first, which is what really interested me: where does the line between fact and fiction start? To me it’s simple – a real event or experience, a real story of a real person, is fact. You can muddle the edges a little, change the weather or the setting, but it’s still that person’s story. However, in reality it’s not quite as easy to define because our fictions are built from a million personal experiences. We are inspired by overheard conversations, or newspaper articles: I am a great fan of writing in my notebook when something piques my interest, and all these things can be seen as a muddying of the waters. My underlying belief is that if someone I know/know of can identify themself and their story in my work, I have not written a ‘proper’ fiction. This line of thought sits much more appropriately in my poetry, where truth is as I see and feel it. Poetry is my place to tell my story. Not all the poems are inhabited by real people or experiences but they have flickered as ideas in my mind as a a result of things I have heard or seen. They have met a need to process my emotions or experiences. Fiction is not a place where I tell my own story. It’s a place where I tell the story I want to read, the one I want to share – and that is a profound difference in my eyes. As a writer it’s important to consider why I have such strong feelings about that line, and why I worry about crossing it. At the core of it, I think it’s because I consider things from the human point of view first – I consider the individual and the impact my work will have on them – and the narrative second. Does that make me silence my writing voice sometimes? Probably; but it’s the choice I made and the only one I feel comfortable with. Poetry exists as a half-way house of my vision of an indistinct world but even there the other players are shadowy and indistinct enough to be unrecognisable to the outside world. For me it comes down to a different truth than Cusk’s; in my truth there has to be a line between fiction and non-fiction, if only so a writer can decide whether they are willing to cross it. Fundamentally, it’s about the morality of writing – and the only guidance we have on that is the legal framework, and ourselves. Yesterday was the 400th anniversary of Shakespeare’s death. Enjoy his work or not, it has had a profound and lasting impact on English language and on storytelling. His work is still studied in schools, colleges and universities; his plays are constantly in production on the stage and have been filmed for both cinema and TV release; his phrases are still in everyday use. I was fortunate enough to get tickets to see the Royal Shakespeare Company perform yesterday – I will tell you about that on my return. I have an interest Shakespeare, even though King Lear remains on my ‘do not revisit’ list. Not quite a soft spot, but maybe it’s forming! I did not appreciate him in my youth, to be truthful. However, as I get older, and se performances of his work by countless skilled performers, with staging that has varied from the beautiful colour and magic of Baz Luhrmann’s Romeo and Juliet film to the sparseness of the Donmar Warehouse’s Coriolanus, I understand the longevity. There are so many ways to interpret and portray the themes in the plays that every time you can see something new. He was a poet, too; I had one of his more well-known sonnets – sonnet 116 – read at my wedding, something I would never have anticipated in my schooldays! There is a truth in the words that I struggled to find in other works: it talks not only of the joy and wonderment of love but of the constancy of it in the face of life’s battles. If you get a chance to see his works, do – the worst case is that you don’t enjoy it all that much, but who knows – like me, you could find a new source of inspiration and entertainment! I love books. I love the smell of them, the feel of them, the excitement as I turn the pages to that first word. I love to see them all on my shelves and I would give up tv and music before I gave up my books. Do I choose a fantasy, a romance, a classic, a murder mystery, a police procedural, a spy thriller, a literary fiction, a non-fiction, a poetry anthology? Do I try something a bit new for me, or something more familiar? Most importantly, I want to find a new voice to add to the written chorus of my life. I want to keep seeking out writers, in every form, who I haven’t discovered before and who bring a new dimension to my reading. A while ago, I thought about going back to my studies and taking a qualification in English Literature (language, not origin! ); it would give a depth to my experience of reading. It’s what I imagined I would do, when I was a little girl, and before the discovery of social sciences changed my worldview. But every time I think about it I wonder what I would lose at the same time. I wouldn’t have time to explore everything I wanted to because I would be so focussed on a few books/plays/poems. Almost certainly, I would spend time with a writer who doesn’t bring their world to life for me (there are a few, although happily it is only a few). I might lose my joy in a particular favourite. I don’t need another qualification and I don’t want my love of reading to be diminished (it happened once before, which I lay squarely at the feet of King Lear! ), so I never go beyond the thought. But it is always there – because reading is a huge part of who I am and what influences my own writing. Maybe one day. For now, I will choose a book from the horn of plenty that is my bookshelf, and revel in the fact that I can read whatever I like. Not everyone can say that, and I know how incredibly fortunate that makes me. Well, you didn’t really think I’d complete one this week, did you? No, it’s another week of not reading enough. I am getting some reading done, a chapter here and a chapter there, but not enough to actually finish anything. 1. A Christmas Carol, by Charles Dickens. Pretty much every year, a version of this is on TV. We probably all know the story, whether we have read the book or not; it has to be one of the most adapted stories I can think of! This is on my to-read pile but I don’t generally enjoy Dickens so it keeps slipping to next year, and next year, and next year… Maybe I’ll read it between Christmas and New Year. Next year! 2. The Little Match Girl, by Hans Christian Andersen. I read this when I was a child and re-reading the synopsis for today brought back the chills it sent down my spine. This is a story to remind people to be kind to each other, and is particularly relevant at a time when more and more people are homeless, without basic necessities, without a place of safety to stay. 3. The Snowman, by Raymond Briggs. This isn’t a reading book; it’s a picture book – and probably more famous for its animated film than its original incarnation now. I love the film, it’s really part of Christmas here in the UK now, I think, along with the song made famous from the soundtrack! 4. The Dark is Rising, by Susan Cooper. This is a book set from midwinter through Christmas, so it snuck in 🙂 I loved, loved, loved the Dark is Rising series as a child. 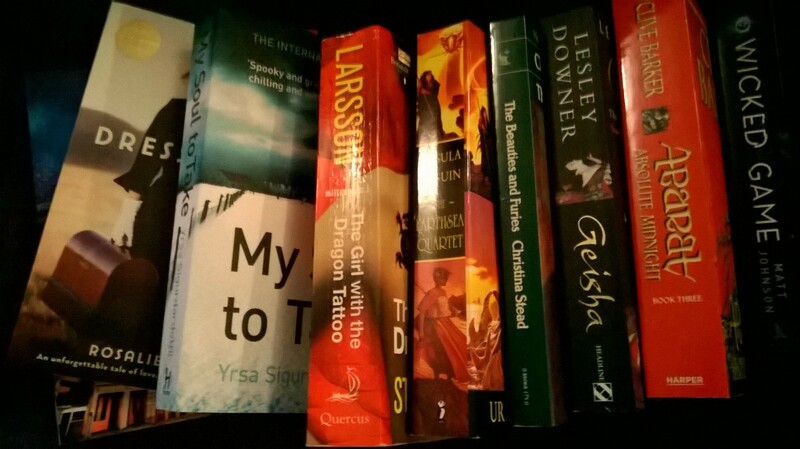 When I lent my battered copies to my niece, she and my sister could see how they had shaped my thinking on certain aspects of myth and legend, so they obviously had a profound impact on me! I think everyone should read them because they are fabulous! Well, that’s a few that have meaning to me – what about you? Free Post Thursday – How To…? As it’s the last Thursday of the month I’ve been at writing group, where there was a lot of talk about how to do things – how to run a competition, how to present a script, how to publish a memoir. We used to have a kid’s TV show here called How 2, which explained how to do all sorts of things that kids might want to know about – it was science, maths and design all rolled in together, fun and educational at the same time (well, I think so anyway!). We could have done with a few of their solutions today. Unfortunately as writers there are very few answers that have a guaranteed outcome. Everything has pros and cons, and it is up to us to research them and decide for ourselves which options are the best. Sometimes you can’t know, and you have to take a stab in the dark, rely on blind faith, trust your judgement – or any one of a hundred clichés you may have heard. Sometimes you have to go all Nike and Just Do It. So take one thing, stop asking how, and start saying when. Give yourself permission to do things differently and see where it takes you. It might just take you to a whole new set of possibilities!